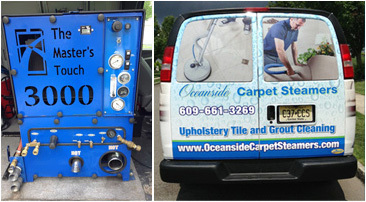 Oceanside Carpet Steamers Service is based in Barnegat New Jersey and we are a highly experienced carpet cleaning, rug cleaning, upholstery cleaning, tile and grout cleaning company. We provide our customers with services that revive and restore their environments at home and work. Our goal is customer satisfaction. Throughout the years we have made every effort to provide our clients with reliable and high quality service. Oceanside Carpet Steamers uses a truck mounted system, a powerful and modern cleaning equipment and we will leave your carpet dry enough to walk on and clean. Our cleaning products are safe for your home, your family, your pets and the environment. Oceanside Carpet Steamers understands that your home is important to you. So is your time. Now you can relax and leave all your cleaning needs to us. Oceanside Carpet Steamers believes that the service we provide must be the best you can get. So call us 609-661-3269 today for a quote or schedule for your cleaning job in the Barnegat New Jersey and surrounding area.